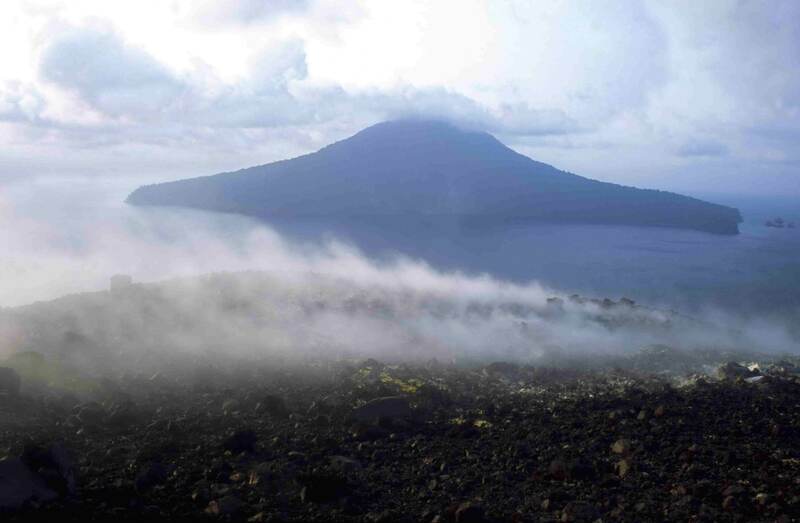 There used to be small eruptions every year on Krakatoa but I had been warned that the world’s most iconographic volcano seems to have been holding its breath for the last five years. Since I would be spending a few days photographing one of the most unpredictable patches of real-estate in the world I could only hope that the “ceasefire” would last a little longer. According to records, the early months of 1883 were also ominously quiet. Then on 27 August, the biggest explosion ever heard by modern man shook the world. The sound of “distant cannon-fire” was reported from as far away as central Australia and Sri Lanka. The shockwave circled the world seven times and the great wave was 10 storeys tall by the time it hit the coast. Few were alive to witness that terror however; most of the 36,417 victims had already been killed by earlier, smaller tsunamis. The dust circled the world for a series of “summerless years”, which were marked with such apocalyptic sunsets that they gave birth to a new school of painting. (Books like Bram Stoker’s Dracula, were said to be directly inspired by these darkly, brooding years). The Krakatoa archipelago lies just 27 miles west of Java, but the treacherous currents, fickle winds and hungry sharks of the Sunda Straits are all good reasons for hiring a reliable boat and crew. After several days planning my expedition on Java’s Carita Beach I was convinced that, in a young man called Samsul, I had found the most knowledgeable and enthusiastic guide possible. The first island to appear above the horizon was Rakata, tallest point of what is now Krakatoa archipelago. The plants and animals that have colonised Rakata arrived as windblown seeds or floating rafts and just 40 years after the eruption that obliterated all signs of life from Rakata. Scientists recorded 621 animals here. As the boat puttered into the shadow of Rakata’s sheer 800 metre cliff, Samsul pointed out that we were now technically inside the crater. We set up camp under the shade of a narrow band of casuarinas trees that are colonising the ash-covered flank of what is now known as Anak Krakatoa – “Son of Krakatoa”. Anak Krakatoa is growing at a rate of six metres a year, so by the time we reached the summit, shortly after dawn the next morning, it was about a foot taller than it was the last time Samsul had climbed it. I was pleased to see that I was not the only one who was breathing hard. Even before I took my first peek into the crater that a Victorian writer once called “the gates of hell” the noxious gasses were catching in my throat. The wind circled around the peak, driving clouds of sulphur and carbon dioxide first one way and then the other. As I moved around taking photos I tried to keep ahead of this toxic mist and it began to feel as if I was actually on the run from the wind. Yet Krakatoa’s summit also has an eerie beauty; there are patches of bright yellow sulphur crystals that are reminiscent of primrose meadows and there are boulders – still hot from that fiery gullet – that have been frosted with golden crystals. Even so, the jets of steam hissing from the ground reminded me of Samsul’s warning that Krakatoa is due to blow again. I could find little reassurance in the fact that this was only Krakatoa’s “baby” – with only 10 percent of the firepower of its infamous father it is still equal to a thousand atomic bombs. Notes on the name: Apart from the sheer magnitude of the explosion, a major reason why the name “Krakatoa” resonated so much around the world is that it was the first major disaster reported on the embryonic telegraph system. The system was far from perfect, however, and due to what might be described as an electronic “Chinese whisper” the name of the mountain changed in the course of a single day from Krakatau, to Krakatan, to Krakatowa, to Krakatoa. In the Sixties, Hollywood compounded the newspaper errors with the movie Krakatoa, East of Java (Krakatau is actually directly west of Java). I visited Krakatoa on January 2012. Doing post research for my blog, I stumbled on to yours. Wow! I went with Samsul too. Isn’t he the nicest man? And I also had bad weather and waves heading out. The weather was so bad, we only had 2 hours on the mountain. I loved it. It was so raw. But you got to the summit. It wasn’t active? Samsul is probably the perfect guide for Krakatoa. We camped there for a night – right on the beach at the bottom of Anak Krakatoa. It was still very active. The summit was surrounded by hot rocks that had been shot out recently and Samsul said we had to be prepared to move fast if it started blowing again. Was a great experience and I hope to get back to Krakatoa again soon. By the way, not sure if I still have Samsul’s current email. Could you post it here please (and maybe send him this link)? Anybody who wants to take an expedition to Krakatoa ought to go with him.